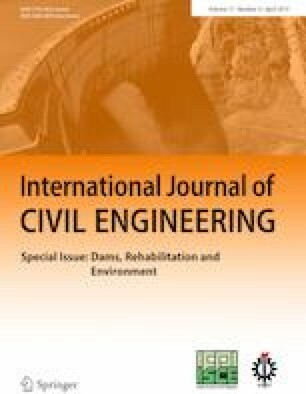 Design and analysis of geosynthetic-reinforced soil structures subjected to repeated loading (e.g. compaction, traffic and earthquake loads) require a proper understanding of the cyclic soil–geosynthetic interface behaviour. This research is undertaken to study the interface properties between sand-expanded polystyrene (EPS) mixtures and geogrid reinforcement under cyclic loading. A series of cyclic tests is performed and the influences of normal stresses, cyclic shear amplitudes and number of cycles are studied. The experiments are conducted using a large-scale direct shear test device allowing to perform displacement-controlled cyclic tests. Accordingly, the influence of the aforementioned parameters on interface shear stiffness and damping ratio is discussed. The results of the experiments showed that adding 0.9% EPS beads to the sand bed leads to the decrease in interface shear stiffness by 30% to 63%, depending on the shear displacement amplitude. In contrast, for the same EPS content ratio, the interface damping increases roughly twice, irrespective of the applied shear displacement amplitude. The value of hardening factor was also found to increase with cycle number under different normal stress levels.